Located in Eastern Utah's high desert, Castle Country is as rich in history as it is in spectacular scenery. From prehistoric beasts to immigrants seeking a better life, Castle Country has it all! Emery County was chosen for its fertile land and the promise of agriculture. As the Utah territory approached statehood, the large county of Emery was divided in two (Emery County and Carbon County). The new county portion was named Carbon for the huge coal deposits found there. When the pioneers settled this Castle Country region, they struggled to carve out a life for their families. Many farmed, some became cattle or sheep ranchers, and still others came to work in the coal mines. The San Rafael Swell was formed when deeply buried Precambrian dike swarm rocks faulted, or broke, during the Laramide orogeny, about 60 million years ago. These "basement" rocks below the present-day Swell moved upwards relative to the surrounding areas and caused the overlying sedimentary rocks to fold into a dome-like shape called an anticline. The resulting structure is analogous to a series of blankets draped over a box. Since that time, the relentless force of running water has eroded the geologic layers, resulting in older rocks becoming exposed in the middle of the Swell, and younger rocks exposed around the edges. 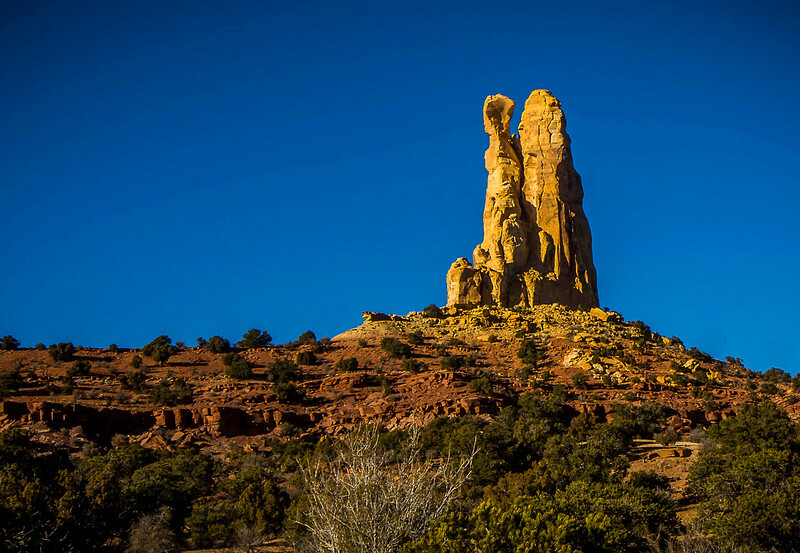 Many of the most impressive landforms are composed of more resistant rocks, including the Jurassic Navajo Sandstone, Jurassic Wingate Sandstone, and Permian Coconino Sandstone. The folding is much steeper on the eastern edge of the Swell than in the west, and this eastern edge is referred to as the San Rafael Reef. Both the San Rafael River and Muddy Creek drain out of the high Wasatch Plateau and the cut directly across the uplift of the Reef, which marks them as superimposed streams, pre-dating the time of the uplift. 147 million years ago this area belonged to the dinosaurs. There are still footprints and thousands of bones left by Allosaurus, Stegosaurus, and Camptosaurus, as well as the long necked Camarasaurus. Today visitors can see where these mighty animals lived and died by visiting the Cleveland-Lloyd Dinosaur Quarry in Emery County. The local College of Eastern Utah Museum in Price and the Museum of the San Rafael in Castle Dale feature life sized skeletons and information on all of these dinosaurs. During the Ice Age, the first humans entered Castle Country. These nomadic tribes are known today as the Paleo Indians. Although little remains of their culture today, these people opened the door for other prehistoric Indian cultures to make their homes in Eastern Utah. The Archaic culture left behind striking and haunting rock art images as they made their way across the area looking for game. The Fremont people built permanent villages as they survived on farming and hunting. Their rock art adorns the walls of Nine Mile Canyon east of Price. The world famous Nine Mile Canyon is known as the world's longest art gallery with petroglyphs and pictographs covering nearly every mile of its 50 mile length and has been nominated to the National Register of Historic Sites. Emery County was chosen for its fertile land and the promise of agriculture. As the Utah territory approached statehood, the large county of Emery was divided in two (Emery County and Carbon County). The new county portion was named Carbon for the huge coal deposits found there. When the pioneers settled this Castle Country region, they struggled to carve out a life for their families. Many farmed, some became cattle or sheep ranchers, and still others came to work in the coal mines.